I do not know exactly where to begin this letter. It has been a long , long time. I think I will begin from the last time we saw each other in Accra. It was, I believe in 1962 and I was returning by boat to Nigeria. I was to meet Mr. Nkrumah but he-had suffered from a "bomb" and asked you and the Minister of Education. Mr. Kojo Botio to meet me. After visiting the housing estate in Tema, we drove to your house for lunch. Shandor and Kobina Mbura were there. After some drinks, we all went downstairs to the dining room- and a prayer was said after being served with food. It was at that time that you were called and the police took you away. As soon as I learnt what happened from Dr. Shandorf, I was mad and made a statement to the press that this was shocking. My guests and I sorrowfully returned to the boat that day. When we arrived in Nigeria, Zik wrote a letter to Nkrumah and asked me to go and deliver it to him in person in Ghana. I did . It was at that time that Nkrumah told me that you were the person who planted the bomb that hurt him. I did not believe it but he swore it to be true. I met Nkrumah again in exile in 1970 at Conakrey, Guinea. At that meeting, He confessed to me that he had found out that it was his Chief of Police who planted the bomb and laid the blame on you he swore he did not learn about this until he was in exile in Guinea. At that time he was suffering from cancer of the prostate which finally killed him when he was flown to Rumania or somewhere to be treated, As I said, it has been a long time. I enclose herewith a photograph we all took in Lincoln in 1939. I trust you can identify all of us. I am afraid that only you, Orizu and I are still alive, in that photograph. Professor Nwankwo Chukwuemeka died last year soon after the Right Honorable Dr. Nnamdi Azikiwe died- Zik was coming to me in Canada every year for the last ten years for medical check-up until his last visit in the summer of 1995. How is Dr. Shandorf? We corresponded with each but about three years now, I have not heard from him. I am anxious to know about Kobina Mbura. Please will you kindly give me his address. This letter is being sent through Mr. John Ighorewo. John is a personal friend and he is my "son". John is from Nigeria and lives here in Ottawa. He has been exploring some business opportunities in Ghana with some Canadian partners for about eighteen months now. They ran into some crooks who have duped them. He narrated the heart- rendering story to me and I promised that I shall write you as you can give him all the advise he needs in doing business in Ghana. [link missing]Below is a Satellite sound recorded interview with Dr. Okechukwu Ikejianni on June 6th 2002. He is the only survivor of the first 8 African students at Lincoln in the U.S. He graduated in 1942 - You can download or just listen to the interview; these clips are uncut, unedited and original; more at Leaders Kwame Nrumah's Confession About the "Bomb" that lead to Dr. Ako Adjei's arrest for no apparent reason. This is very baseless thinking on behalf of Dr. Kwame Nkrumah. 2) Treason, together with four other persons, namely, Robert Benjamin Otchere, Joseph Yaw Manu, Tawia Adamafio and Hugh Horatio Cofie Crabbe. They were tried by a Special Court constituted by Justice K. Arku Korsah, Chief Justice, Mr. Justice W. B. van Lare and Mr. Justice E. Akufo Addo, both Justices of the Supreme Court. On Monday 9th December, 1963, the Special Court, which had sat from Friday 9th August 1963 through to Monday, 28th October, 1963, acquitted and discharged Tawia Adamafio, Ako Adjel and Cofie Crabbe on all charges. Notwithstanding their acquittal and discharge, these three gentlemen were not released from prison, but rather, were taken back to the Nsawam Medium Security Prison on the orders of Dr. Kwame Nkrumah, the President. The harrowing experience in the condemned cell continued as before. On 10th December, 1963, Dr. Kwame Nkrumah, the President of Ghana, declared the whole trial at the Special Court null and void. He also made an order, dismissing from office the Chief Justice of Ghana, Sir Arku Korsah and the other two judges who together with the Chief Justice presided over the Special Court. The President Dr. Kwame Nkrumah, ordered a retrial of the three accused persons by another" Special Court" specially constituted by him. The newly constituted "Special Court" had the newly appointed Chief Justice of Ghana, namely, Mr. Justice J. Sarkodee-Adoo as the sole member, sitting with a jury of twelve young-men, recruited from the Kwame Nkrumah ideological College. The Ghana Bar Association, realizing that the action taken by the President, Dr Kwame Nkrumah, in declaring the earlier trial null and void, dismissing the trial judges and reconstituting another special court amounted to undue interference in the administration of justice in Ghana, resolved that none of its members should appear for any of the accused persons. The GBA considered the whole process as a complete travesty of justice and a flagrant violation of the fundamental principle of the Rule of Law in a civilized Society. The second trial was conducted partly in public in the Supreme Court Buildings in Accra and partly in camera at the Castle Osu, Accra. The public and the Press were excluded from the trial in camera. During his summing up the Chief Justice, Mr. Justice Sakordee-Adoo wept bitterly and openly. Dr Ako Adjei recorded in his autobiography, The African Dream, that he was amazed to see the Chief Justice weeping bitterly "with tears streaming down his cheeks." He felt sorry for him and pitied him for the part he was taking in his second trial, because he, Dr. Ako Adjei, knew he was innocent. Dr. Ako Adjei was found guilty and sentenced to death, as was each of the four other accused persons. In response to the Chief Justice's offer to the accused to say a few words before sentence, Dr. Ako Adjei said that he was innocent, but if the Jury had said that he was guilty, he would leave the matter in the hands of God, his Father. He was taken, together with the other accused persons, back to the condemned cells. The sentence was later commuted to twenty years in prison. 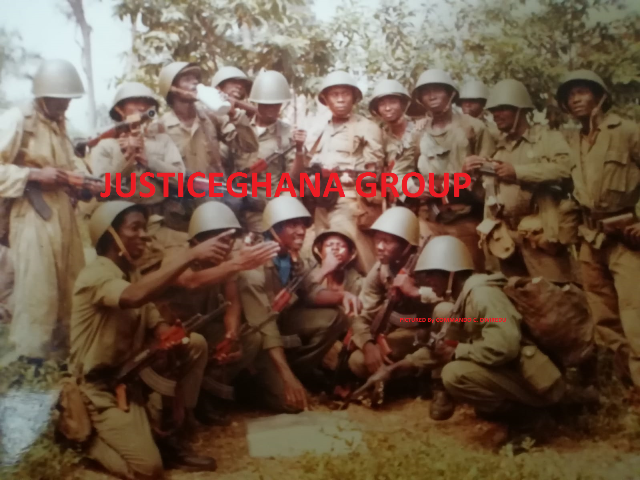 Whilst he was in the condemned cell, he heard Mr. Samuel Danso Amaning (at one time Deputy Commissioner of Police), who was also being kept in a condemned cell, shouting at the top of his voice and mentioning the names of Ako Adjei, Tawiah Adamafio and Cofie Crabbe, that each of them should forgive him for the leading role he took in fabricating the treason charges against them, which resulted in their trials at the two special courts. The excruciating experiences that Dr. Ako Adjei went through during his period in the condemned cells, so overwhelmed him, that he found it difficult to recount or talk about them. He wrote: "It was a period of harrowing experience and bitter affliction". He had no doubt that it was only "by the Grace of God my loving Father that I survived”, he concluded. Indeed, since his release from Nsawam Medium Security Prison on 6th September 1966, by the National Liberation Council (NLC), after the overthrow of the First Republic, he never stopped praising and thanking God Almighty for protecting and delivering him from his affliction. From then on, he devoted his time to the Almighty God, his family, his law practice and farming. In 1978, Dr. Ako Adjei was appointed by the Supreme Military Council II Government as one of the Members of the Constitutional Commission who drafted the Third Republican Constitution of Ghana. On 7th March 1997, the highest National Honor of the Republic of Ghana, Officer of the Order of the Star of Ghana, was conferred on him by the President on behalf of the Government and People of Ghana. This was followed by a durbar of Chiefs, as well as a dinner at The International Conference Centre on 15th March 1997, by The Ga-Dangme Association. The Ghana Bar Association honoured him for his Statesmanship in January 1999. On 11 December 1999, he received a Certificate of Honour from Labone Secondary School. He received a Millenium Excellence Award for Outstanding Statesman in December 1999. The Methodist Church Ghana honoured him in June 2000 by naming the Conference Hall of the Rev. Peter Kwei Dagadu of the Memorial Methodist Church at Osu, after him. Dr. E. Ako Adjei wrote two books, namely: The African Dream and Life and Work of George Alfred Grant respectively. He was honoured by his Alma Mater, Accra Academy, during its 70th anniversary celebrations in July 2001. Dr. Ako Adjei left behind a loving wife, children, grandchildren, family, friends and a host of admirers.